Dr. Temple Grandin is without question a one-of-a-kind learner and teacher, professor of animal science, and chronicler of 'the autistic mind', visual thinking, and the power of both education and vocation. Here she speaks about both, as well as fiber bundles in the brain, animal welfare, and the importance for society itself in recognizing all kinds of (human) minds. Recently having exploded into public celebrity as the subject of an Emmy Award-winning movie, Dr. Grandin has long been the definitive expert on both 'high functioning autism' and 'how animals think'. Psychologists, cattle breeders, and the many people she has inspired, know her for many years of both autobiographical and scientific looks at the thinking of all kinds of minds, both animal and human. A profound influence on my own understanding of autism and Asperger Syndrome, precisely and scientifically explained by someone who knows first-hand - experientially as well as scientifically - Grandin describes autistic thinking clearly and articulately. It is easy to understand why so many people have been fascinated and appreciative of her sharing her life and work. She also makes a persuasive case for 'why the world needs all kinds of minds'. What follows is a 'virtual', or 'asynchronously live' report from this year's Amerian Psychological Association Convention (August 2014). I tried my best to accurately quote and edit so that this will be as much as possible like 'being here'. I've not seen the movie, but can share that since it aired my website has been deluged by requests for Temple Grandin articles. Having been fascinated by her observations and passions myself, I'm very grateful to Temple Grandin for allowing me to use these visual 'souvenirs' to accompany this report and add to the visual imagery along with her words. Like many, I've often drawn on Grandin's original biographical and scientific articles - from her 'squeeze' machine to her aversion to scratchy clothes and her focused but sometimes interpersonally difficult times in school, to her description of 'visual thinking'. I have worked with several autistic and/or 'Asperger' populations, and can relate to the themes here, of 'stretching' the limits of an autistic mind, something mainstream media is spotlighting of late. Dr. Grandin credits speech teachers, family, teachers, and others who can instill a work ethic via engaging 'all kinds of minds'. Temple Grandin has always provided the best, most precise description of autism, from an autistic person's perspective, and also in working as a diagnostician, providing counseling, or being a sibling or parent. This is especially exciting for me as a psychologist who in fact works with, and has long tried to nurture, 'all kinds of minds'. What follows will, I hope, be as fascinating to you as it was for me, even without the magic of the enthusiasm in her voice (picture a Midwest teacher driving home lessons which she has herself learned) or her ad libbed humor about illogical top-down thinkers, or her charismatic presence. So this is edited but accurate, and linear (for linear thinkers) but with her own words as her own narrative and some images too, for visual thinkers. A great teacher and lecturer, and a renowned plant designer, autism advocate and animal welfare advocate too... Temple Grandin gives us a unique glimpse into what it's like to actually live and experience life through the prism (and spectrum) of autism. Her example and research allow anyone who listens and cares, to better understand autistic thinking and behavior. Dr. Grandin has been inspirational for parents, teachers, brain researchers, and psychologists demonstrating and explaining things, through her eyes. (She's perhaps the world's most well-known visual thinker.) There is often much more going on than what many people think of as "autistic" thinking. Many people envision the extreme end of the severity spectrum, perhaps non-verbal, or with rocking or self-stimulating repetitive behavior. Some 'very autistic people', however, can be 'stretched' and taught rules and find ways to tap into great talents nobody ever knew were there. Yes, there is a spectrum. If anyone on earth can explain autism, visual thinking, brain 'abnormalities', and their impact on learning and daily life, it is this woman. Here is the world's hardest-working expert on autistic thinking, drawing on personal experience, industrial design, brain scans, research, and what might be called extreme mindfulness, with a special kind of genius and determination and work ethic: The one and only Dr. Temple Grandin. "I think I'll start out and just tell a little bit about myself. When I was 3 1/2 years old, I had all the full-blown symptoms of autism. No speech until 3 1/2 to four. I cannot emphasize enough, the importance of early educational intervention. And I got into a really good, early program. And I spent of lot of time with these kids. The other big emphasis was on turn-taking - doing games involving turn-taking. 'Cause you've got to learn to wait and take your turn!. Now it's been interesting for me for a long time, to learn about how different people think, because when I was young I thought everyone thought exactly like I think. Now the thing is: When does normal variation become an 'abnormality'? There's no black and white dividing line. You now, there's research that shows that people with bipolar in the family have got more siblings in creative careers. Autism: there's more techies.... you know. It's not a black and white dividing line!" "Now the thing is, I do a lot of things in the autism community and I also do a lot of things in the livestock community. And I can think of kids that I went to college with that would be called Aspergers today, or autistic, or speech impaired. And they've all got good jobs. And why have they got good jobs? The other problem is, now with the diagnostics change, what I'm seeing in some states is, now it's this huge 'autism' quagmire, going from Silicon Valley and really smart people, down to somebody that's got a very, very severe impairment. In fact, the Silicon Valley people, they avoid the labels. I also have gone over and I've done talks at gifted conferences. And I'm seeing the same geeky, little nerdy kids! So one kid's going down a very different path than a different kid. But I'm seeing too many kids on the high end of the spectrum getting addicted to video games, not learning any work skills, and ending up on Social Security. And then I go down to the meat packing plant, and there's an old grey-haired hippie, he's my age, and he runs the maintenance shop. And he came straight out of the trailer park. And the thing that saved him was the skilled trades classes. All right, here are two Time Magazine People of the Year - I think Einstein got Person of the Century. Little Albert here: No language until age 3. And there's a new special edition of Time about [Einstein], and he had a lot of temper tantrums. How about Little Steve Jobs? Well, little Stevie... he was a weird loner who brought snakes to school [and] got bullied and teased in school. Boy, I was one of the people who got bullied and teased in school. High school: Worst part of my life!" " And what saved me? Shared interests. Getting social interactions with shared interests. [For me] it was horseback riding, model rockets, and electronics... And these places were refuges away from the teasing. [We have] got to get kids into those sorts of things! Now I just read a book review about Beethoven. I've got to get ahold of this book, because I think Beethoven probably also was labeled autistic, or Aspergers today. [The review] says that he's a real loner. I haven't read the book yet, I've just read the reviews. I mean, Mozart: He was pretty weird too. Now I think we need to start looking at personality traits more like a music mixing board. You know... [she gestures, the idea being to simulate being in front of a mixing board with many sliders to raise or lower the level of specific channels] 'More anxious', 'less anxious', 'more visual thinking', 'less visual thinking'. The other thing I want to really emphasize, things that helped me. I was raised in the 50's. Social skills were pounded into kids in the 50's. You were taught to say 'please' and 'thank you'. You were taught 'table manners'. I think today's much less structured society actually herded [sic - hurt?] some of these really smart kids. The other big problem I'm seeing today is kids are not learning job skills. When I was 13, Mother got me a sewing job that I did with a lady who did freelance sewing. When I was 15 I cleaned eight horse stalls every day and ran a horse farm. And then I was painting signs and sewing, doing carpentry work... When I was in college, working in a research lab where I had to rent my own house. You see, there's a tendency for a lot of parents to over-protect and coddle these kids. I'll be at an autism meeting and they'll bring little Tommy up, and Mom's doing all the talking. Well, little Tommy needs to start learning how to do the the talking. Mother had a very good sense of how much to STRETCH me. You've got to stretch these kids just outside the comfort zone. Because if you don't stretch them, they don't develop. I'm seeing too many kids today who haven't learned to shop! They don't [know how to] order food in restaurants. It's absolutely ridiculous. The work that I do as a visual thinker is a field called 'industrial design'. You see, when a product gets designed, something like an iPhone for an example, every time you look at that interface on your smart phone, that wasn't made by an engineer. That interface came from an artist. Steve Jobs was an artist, the industrial designer. Then the engineers, they gotta make the inside of that phone work. See, this is an example of the different minds working together. And... an interesting article in there, on art schools teaching entrepreneurship. Because you've got to learn how to sell your skills! And when you're really weird you've got to sell your work and show off your work. Now I used to joke around that I had a HUGE visual thinking circuit that went deep into my visual cortex. Now I have a chance to go, you know, and have lots of fun and see all the latest brain scanning equipment. You know: 'Voyage to the Center of My Mind'. And I'm really interested in this sort of thing. But I want to emphasize, I am a college professor first. I am a livestock specialist first. In fact, now that things have been getting so much attention, I've actually been writing [and 'upping' ?] the amount of livestock stuff I'm doing. Because I'm getting very concerned that too many of these kids are getting totally fixated on their autism. Yes, it's fine to be into autism advocacy, but I don't think that's the first thing that you ought to be doing. You need to actually have a real job. We've got to get these kids in real jobs. We've got Silicon Valley. Woo! They're all on the spectrum. And they avoid the labels. Or maybe he's a famous movie producer.... And another geek is going to the basement to play video games, on Social Security. One place where my family and my schools drew a line in the sand: I was NOT allowed to become a recluse in my room. When I was in high school, then boarding school, I didn't want to go to movie night. They gave me a choice. Choices are good. I could be the projectionist or I could sit in the audience. But not going wasn't going to be an option. So I chose to be the projectionist. When I was 15 I was afraid to go to my aunt's ranch. And if I hadn't gone to my aunt's ranch I would never have gotten involved in cattle. And Mother said to me, 'if you don't like it you can stay for only a week'. But she wouldn't let me not go. The week, or all summer. I went, and I loved it. ... which brings up the important thing: how the kids get interested in stuff. You've got to expose them to things they can get interested in! And I think this is one of the big problems we've got today, schools taking out so many different activities that could be a basis for careers. You know, like Patrick Stewart, Captain Picard? He came from a very troubled background. He was saved by the school play at age 12. That's what saved him. Yeah, I had a big visual thinking circuit. And, you know, there's some people who have got a bigger one. There's an art professor that's got one that's bigger. But I'm probably in the top 25% for having a great big gigantic circuit that goes from primary data files to pictures - just like Google Images - up to the language part of the brain. These are fiber bundle circuits. I got a little tiny shrimp here. 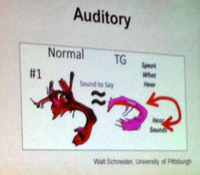 I am NOT an auditory learner. I cannot remember long strings of information. My working memory is absolutely terrible. 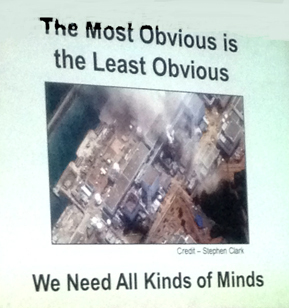 (And I went to a session this morning: I need working memory for creativity? Yeah, musical creativity yes, but not for visual creativity. Don't need working memory for that.) OK, here's the fiber bundle for 'speak what you see'. This goes from the visual cortex up to the language parts of the brain. 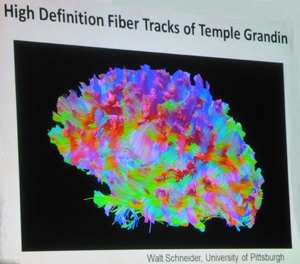 This is Walter Schneider's, state-of-the-art, high definition [fiber tracking] imaging....it can track the actual fiber bundles. I got lots of extra bushes there! Now the thing is, if we scanned 100 people, let's go to an art school, and scan a bunch of people, and we'll scan a bunch of stock brokers... You know, at what point does extra bushes become abnormal? You know I don't think there's a black and white dividing line. Now I think this has something to do with why, when you give me a key word, pictures come up. But the price I pay for those extra branches is I've got less fibers for bandwidth, for 'speak what I see'. And I had trouble with speech delays and I have trouble getting my speech out. That's my problem. All, right, 'what is blue is full of water'. 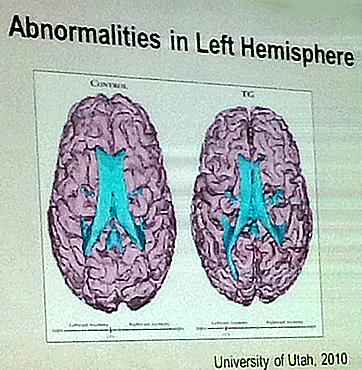 A brain scan reveals asymmetric left-hemisphere functioning. You can see there that I have an asymmetry. That wrecked working memory. That wrecked algebra department. And you get kids that are kind of different. They're going to be good at one thing and bad at something else. And there's way too much emphasis on the deficits and not enough emphasis on building skills. When I was a little kid - in 3rd and 4th grade, my ability in art was always encouraged. But I wasn't allowed to just draw the same horse head over and over again. I was encouraged to draw lots of different things, because you got to learn to do artwork that other people are going to want. Now, algebra... I'll tell you right now: For most trades, for all the things I'd need, I didn't need algebra. 'So how'd you manage to get to college?' Thank goodness for the educational fad of '66 and '67. Because the educational fad then [in mathematics was focused on] probability, matrices and statistics. And with lots of tutoring I was able to get through. But I get worried we're going to shut out the visual thinkers. Well, when I was in college I wanted to learn computer programming, and... Bill Gates and I, in 1968, both had access to this state of the art IBM teletype. No punch cards here! Really, really state of the art. I did punch cards later. Lots of fun, mechanical spread sheets. Know why airline boarding passes are the size that they are? They are an evolutionary remnant of the card punching machine. Those cardboard boarding passes? I tell my students that we used to sort boarding passes in a mechanical spreadsheet. They go, 'you did what?!' I say, yup, that was my master's thesis. The thing is that Bill Gates could do the programming and I couldn't. You see, where I think innate ability makes the biggest difference is on strengths [other than] where you have a really, really great skill, and on something where you have a real disability. I just couldn't get programming. You know, Malcolm Gladwell will say if you have enough practice and enough access to teaching anybody can do anything. Well I'm sorry. I had plenty of teaching, plenty of access. I just couldn't do it. You see, in the brain, you've got circuits for 'what is something'- that's my kind of mind, 'object-visual thinker'. You also have circuits for 'where is something? ', where are you located in space? That's the more mathematical kind of mind. Then you have people [Verbal Facts Language Translators] who can't do drawing. And then you have others [Auditory Thinkers] - I had a dyslexic student who was a pure auditory thinker. I gave her a camera and she couldn't have cared less about it. Now you want evidence that there really are these two types of visual thinkers? The evidence is in my book, The Autistic Brain. [Grandin apologized for not having copies with her, but noted that this and her other books are available at Amazon.com - Some of her early experiential and theoretical papers are available at templegrandin.com and on this site. 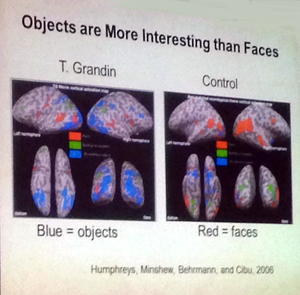 Grandin also recommended two resources, 'Evidence for two types of visualizers', Marie Kozhevnikof, 2005; and 'Pet Meta-Analysis of Object and Spatial Mental Images', Angelique Mazard, 2004.] Evidence shows that there actually are two types: object visualizers and pattern-thinking visualizers. 'Pet Analysis', really a great paper. OK, just to show you that there's two ways to do the math - there's the verbal way, and visual-spatial. Then you get into the whole issue that they want you to 'show your work'. Well some people don't need to show the work. They just do it. You know, people don't get it, there are really different kinds of minds! I want to give you a glimpse into the mathematical pattern thinker. This is not MY mind. 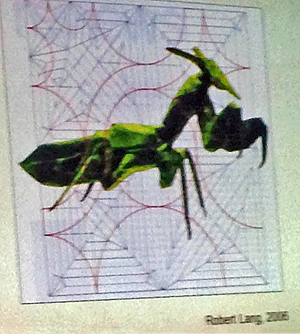 This praying mantis is made out of a single sheet of folded paper, no cutting, no tape. And what you see in the background, that is the folding pattern for making this praying mantis. That's extreme origami. Cool stuff here. I also read... both papers yesterday had an article about an origami way of making self-assembling machines. Very, very cool. I read about that on the plane.... [One of her inticrate diagrams appears onscreen momentarily.] I always like to show my drawings off. Now here's a picture from Jessy Park [autistic artist]. She's going to have to live in a supervised situation. But she's doing artwork now, professionally. But this talent had to be developed. 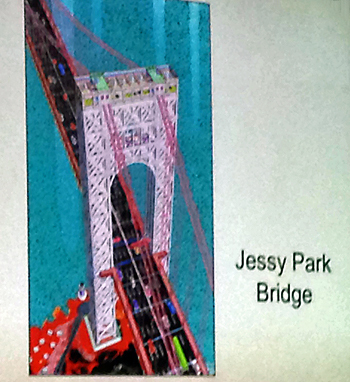 Because, you know what Jessy Park used to like to draw? Electric blanket controls. (Some laughter, Temple Grandin smiles too). Nobody wants that! (laughter/applause) You've got to work, you know, on using your skill to produce something that other people actually want. 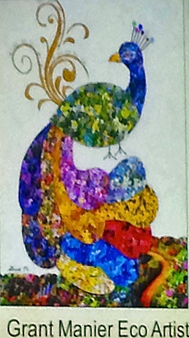 Here's gorgeous artwork done by Grant Manier, the Eco-artist. And he's been showing professionally now. And now that he's been out doing professional shows, he's like a new Grant! He used to be really shy before. Now he talks to everybody. You know, people say to me, well, 'How'd you get good with public speaking?'. Doing it. And I'd read my evaluations real carefully. Because when I was in graduate school, I gave my very first talk and I walked out, and that wasn't really very good. Now, we've got to make sure that when we do accommodations, we do accommodations that enable. You know, letting some really shy kid Skype his school talk? Uh uh. No. You've got to get up and do it in front of real people. All right, this is why all you math and algebra fanatics out there need to have my kind of mind. Anybody know what that is? It's not something you want to get close to. It is the remains of the Fukushima Nuclear Power Plant. They made a visual thinking mistake. I can't design a nuclear reactor. But if I had been the drafting designer drawing up [the plans], I would have been going 'Wait a minute here! The sea wall's breached. This basement full of all of our emergency pumps and emergency generators is going to be full of water.' You know what would have prevented this? Water-tight doors. Regular old submarine, crank-em-shut doors. If they had them, it wouldn't have happened. This is a mistake I would have never had made. I can't design the reactor, but you know, all you math heads, you need my kind of mind too. The very first work that I did with cattle was to go out to the feed yards, and I noticed that animals notice detail. Autistic minds also notice detail. You see, being a visual thinker helped me in my animal behavior work. In fact...I've written about that in my book, Animals in Translation. So I noticed that a lot of details that most people don't notice, spook the cattle: things like a hose on the floor, a shadow, a reflection. OK, now that I've told you about this, how many of you noticed that that animal was looking at that sunbeam. How many people noticed that? I want to try to get you to be better observers of visual details. 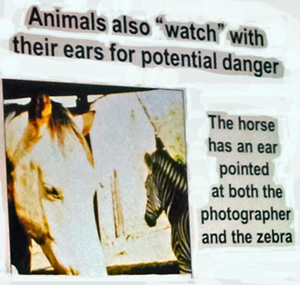 Look at how the zebra and the horse have an ear on each other. And then the other ear is on me. What is your animal doing? Watch for this detail. Animals live in a sensory-based world, not a word world. And I was interested to hear at the creativity talk this morning, that they were talking about more of a sensory way of thinking. Back of the brain, that's where the creativity is. Now I'm always getting asked: are animals scared of getting slaughtered? Well I found they behave the same way in the slaughter house as they do in the veterinary chute. So I show this picture to my students and I say, 'what can I do to fix it?'. Yeah, they'll notice the chain hanging down there, but they don't notice three guys standing right there where they should not be standing. 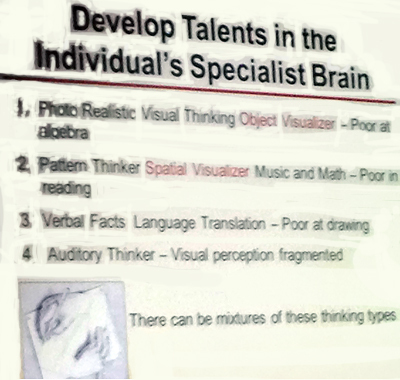 Now, there's evidence that the language covers up things like visual thinking thinking and mathematics. 'In humans, language covers up sensory based thinking'. [We know] because there's a certain type of Alzheimer's: Whereas the language part of the brain gets destroyed, art work comes out. And there's a book out right now - I forgotten the name of it - it's about a guy that got bashed on the head in a bar fight and all of a sudden he became a mathematician. 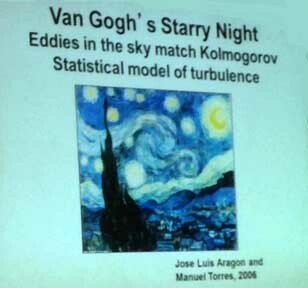 And when Van Gogh came to Starry Night, I don't think he realized he did some mathematics in it. Because the mathematicians got a hold of it and analyzed the stripes, and... there were mathematical concepts. My thinking is bottom up. Most people think top down. Creative thinking has to be more bottom up. You put the details together to form concepts. Concepts consist according to specific examples, into categories. Everything's learned by specific examples. So you got to get these kids that are tending to become recluses and get them out doing things! Well, part of the reasons they don't like doing things is they get anxious. So you don't want to have surprises. But you've got to stretch! You've gotta stretch. I talked to one mom, her kid went to sleep-away camp, he ended up loving it. I would never have gone into the cattle industry if I hadn't gone to my aunt's ranch. My thinking is also associative. That was also brought up in the creativity talks. I went to both of them; they were really really good. I took a whole bunch of notes. I'm going to write about it in the autism magazine that I write for, Autism Digest. It's going to be in my column next month. And I'm going to be writing about these talks. Now, when I ask somebody - most people - to think about 'church steeples', I was shocked to find out that what you get is a vague outline of one. And when I asked an astro-physicist, he saw motion, of people singing and praying. Remember, he's a pattern thinker. I just see specific church pictures - OK, I want to characterize them as New England type, Cathedral Type, Chapel Type... you know, whatever, I can do that. Now just to show you how sensory-based thinking is very specific: Cattle that are trained to be tame for 'the man on the horse' will freak out and get really scared when they see the first 'man on foot'. You've got to train them both - man on the horse, man on the ground. It's a different picture. That's how specific sensory thinking is. Top down thinkers tend to over-generalize! And it's been a real kind of revelation for me, you know, to try to fight this kind of thinking. 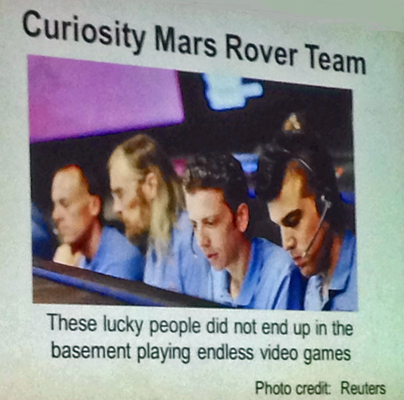 Now here we are, here's the team that put the Mars Rover on Mars. Got to visit this place. Really, super cool! And you see the guy with the long hair there? He was a theater major originally. Theater major! Then he got [involved with] physics. Well, they're definitely a geeky crowd there! You know, what would happen to the junior edition of these guys today? Are they going to become video game recluses? Got to control video game playing! And most of these kids are not going into the video game industry. I'm not suggesting banning, but I don't see these kids going anywhere. Some people say 'you're just being an old fogey'. But I'm not seeing these kids having good outcomes. And the thing I realized is, I come out of the construction industry. For 20 years: Designing stuff, go supervise it being built. In all the major meat packing plants. And when you work in construction, it's all about 'sell it, design it, build it, make it work'. It's all about the project. It's all about the outcome. And that's why we'll see how much that colors my thinking. What's 'good outcomes' for a kid? You stay out of trouble with the law - and that includes domestic abuse.... And you got to support yourself and not be on social security. And something [above] an entry-level job. That would be a good outcome. That's where we need to be going. This is why I'm really so adamant about the working skills. Now I was more interested in looking at pictures of things than looking at pictures of people, when I laid in the scanner. Now the thing is, we need to have people in this world that are interested in things. 'Cause who do you think made the electric, electrical typewriter? It was Tesla! [applause] He would have been autistic today. You've gotta stretch these kids! Another thing I can't emphasize enough is mentors. I had a fabulous science teacher. Let's tap into retirees! OK, the school took out auto shop - 'cause they're totally stupid. Well, let's get a retired person to do a 'Small Engine Repair'. And what's the price.... Come on! Let's just start using some of those resources in the neighborhood. We've got to get some paper route substitutes. How about walking dogs for the neighbors? Museums will take kids as young as 12 to be tour guides. Lots of states will allow safe retail, like working in a clothing store, or shoe store, or something like that, at age 14. [At 16 you can get a work permit in most states.] It lets you work on a lot of the informal things, like farmers markets, maybe at the church, the synagogue or whatever, you set up the chairs every weekend. We've got to get some things that are jobs! " And that is Temple Grandin's perspective on the value of 'doing things', engaging and drawing out talents, teaching to all kinds of minds, recognizing the importance of engagement and the important roles of brain function, teaching, mentors, jobs, and proper respect for the value (and sometimes genius) in having 'all kinds of minds' working together for the sake of all kinds of human endeavors. Dr. Grandin remained for the long line of audience who offered thanks, asked for advice (as parents, psychologists, counselors and educators), and to pose for photos (or 'selfies') and sign autographs. Someone asked about promising medications. The main thing is that this is individual, but Grandin has seen good results typically with low-dose use, one promising medication being disipromine. But in any case, medication is generally used minimally for optimal functioning in terms of mood and anxiety. It's individual of course, but it seems to be the case that "visual thinkers tend to be panic monsters." (How's that for a visual image?) For panic there have been promising results involving Omega 3s and exercise. Grandin does 100 sit-ups every night in the hotel, she said. QU- Any advice for someone's niece, who is autistic, and likes paleantology? A- Sure, said Grandin. One fourth grade teacher, for example, had a class make a pre-historic tool as an assignment. Maybe such encouragement and opportunity will kindle an enduring passion, as livestock did for Grandin. And it's not only science. Returning to the importance of vocational education, she said there are different routes to get into, say, the construction trades. Or, "if you can write code" she sees a huge market need for data miners, who some of the geek world refer to as 'unicorns' because they are so hard to find. Grandin shared that she enjoys reading Business Week while she's flying, as it's a 'fun magazine' in terms of following what's going on in our economy and business world. QU- A mother who listened to Grandin encouraging parents to have a child 'tap into the neighbors' to help find suitable activities, or scooping ice cream at the soda shop, whatever, replied that where she lives there aren't really any programs. A- Grandin asked why people needed programs for things they can do near home. 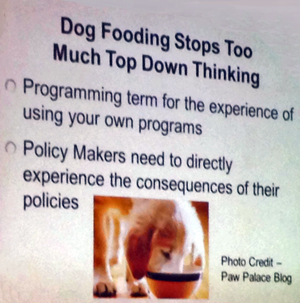 A- Grandin re-emphasized the virtue of 'doing things' to keep engaged. She'd say to the child,"When I was your age I was busy with my bird kite!" and would look toward shared interests to stimulate both social and work-related skills. Dr. Grandin fielded questions about her own life, which has been so well documented. Among other tidbits - many consistent with what she's written about across many years - Grandin shared how she hates oysters, and "I still can't stand scratchy clothes against my skin". 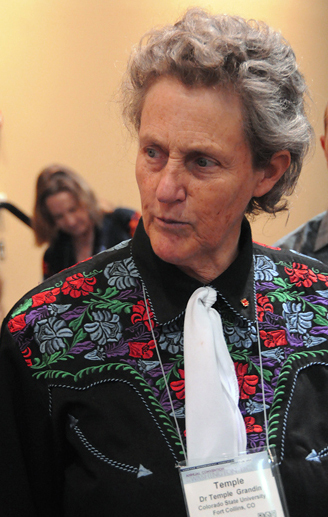 In closing, Dr. Grandin re-emphasized several mantras she shares with people with all kinds of minds, her voice strong and passionate, sharing her insights borne not only from brain study, but from a lifetime of experience and observation through the eyes of a visual-thinking 'autistic savant' with interest in cattle and human thinking and behavior. She speaks in the manner of a teacher, and that she is, on the subject of all kinds of minds, and why the world needs to stimulate and appreciate them. "I want you thinking about doing things", as opposed to being a recluse; Engage others through shared interests to stretch your skills and experience; and "Don't become your label".